Where there is smoke there must be fire, and recently there are so many smokey rumors about the Motorola Moto X+1, the successor to Motorola’s customizable Moto X flagship, that we would not be too surprised if it makes an appearance as early as today - at Google I/O. This latest leak shows the supposed Moto X+1 in what could be a promotional render, and it comes from a ‘reliable’ leaker at 9to5Google. The most notable new feature of this Moto X+1 seems to be its dual front-facing speakers, similar to the setup used in the HTC One (M8). We’ve earlier seen multiple leaks for this alleged Moto X+1 by @evleaks, confirming the dual-speaker arrangement, but also showing a device with no front camera and no flash light for the main camera. 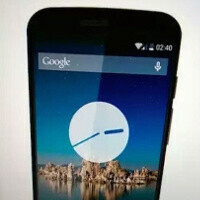 Rumors are that the Moto X+1 could be released under the Motorola Victara codename. All of this is really confusing, though, since it’s hard to imagine a flagship phone with no front camera, and the Moto X+1 seems to have those high ambitions. We’ll leave all this controversy aside for the moment, though - the most exciting part about this latest rumor is actually a speculation that the Moto X+1 could make its first official appearance at Google I/O today. We would be looking forward for an explanation, and we encourage you to tune in to the Google I/O 2014 livestream here to witness it all for yourselves. I never understand why with the decent photos that most smartphones take, leakers still stick with their front facing camera for leaks. Well well well... I just sold my Moto G that I loved and am in the process of selling my Note 3. I was originally planning on getting a Huawei Ascend Mate 2 or OnePlus One. But if this is really getting a 5.2" 1080p and a Snapdragon 800 I just might forgo either and stick with Motorola. I loved the ergonomics of the Moto G and Moto X. THIS SUMMER IS GOING TO BE SO DAMN HARD TO PICK WHICH PHONE TO BUY!!! Google's gonna sell Motorola to Lenovo with a Bang. Expecting a Moto X+1 and refresh of the Motorola Xoom during this IO. But why are they sticking with the S800 and not utilizing the newer S801 or 805? Seems they'll be doing the same thing they did with Moto X, went for an year old S4 Pro instead of newer S600. A refresh of the Xoom? Brother, Motorola hasn't released a new tablet in a couple of years. definitely not going to buy this phone .manufacturers have implemented snapdragon 801 on their flagship phones and 805 on the way. i don't know why motorola is still sticking with snapdragon 800 while it has some serious heating issues causing lesser battery life .this problem was actually solved in snapdragon 801. And Lovehater wins the prize! I really hope this isn't real. Motorola was one company that wasn't joining the big phone race. 5.2 inches is way too big, especially if the front facing speakers thing is true. If 5.2 inches is way too big for you then you must be 5'2". Before leaving Moto for their lack of hardware improvements I thought the S4 was the perfect size until I stated using the Note 3. I like the size of the S5 when it comes to one handed operation but I hate TouchWiz, both new and old so my fingers are crossed with anticipation that this will bring me back to Motorola. I'd love to have a flagship level phone without a front camera. Front cameras are stupid and a waste of both space and money. This render is a fake. How do I know? I’m the author. I didn’t mean to fool everyone. I was just bored, and after I’ve seen the other “leaks” I though: “Is it really that easy? I’ll try.”. So I made a render in like 15 minutes in photoshop, and I posted a photo of it on Android Central forum (http: //forums.androidcentral. com/moto-x2/403101-moto-x-1-leak.html). I didn’t think that it was beleivable. Really. And I didn’t think it would spread all over the internet. I can’t actually believe it. There even was a clue that it was clearly fake: the battery and the signal. I actually feel a bit sorry about all this. Anyway, I have nothing to do with the 5.2” screen thing, nor the other Google I/O thing. The reliable sources are fake. Someone stole my render and recycled it. (moral of the story: do not believe in everything that magically appears on the net.) Some evidence: •The render http s:// hostr. co/file/970/IN45fkSbC9oD/renderwm.png •A screenshot of the render in photoshop https:/ /hostr. co/file/970/07Jlykx20otJ/photoshopscreenshotwm.png •The original, uncropped photo https: //hostr .co/file/970/J2ixhipeVhBS/IMG_20140624_041348.jpg My apologise about all this again. Awesome. Nice job phonearena passing off a "reliable" leak that was simply stolen from another site's forums. Heh, no one seems to care it's a fake. It's a big news (=more visits=more revenue) anyway.